Want to earn or save a dollar while also reducing your impact on the environment? DairyNZ’s sustainability team share 10 steps that will cost you little or nothing. Find out how much nitrogen and phosphate you’re losing from your farm system by using Overseer, a free software application which helps farmers and growers make informed decisions about their nutrient use on-farm. After completing an up-to-date Overseer, you’ll be able to start putting actions in place to reduce losses and your annual fertiliser spend. Your fertiliser representative and/or consultant can help you use Overseer. Maintain accurate records of your annual farm inputs, outputs and management practices. Why? Because having good information at your fingertips allows you to make smart, informed decisions. For example, your nutrient budget will be more accurate so you can work out exactly which nutrient applications are required, potentially reducing your fertiliser cost. Manage the timing of nitrogen fertiliser inputs by monitoring soil temperature and only applying when above 7 degrees Celsius and rising. Pasture growth response rates will be higher at warmer soil temperatures, so you’ll get more dry matter production for your nitrogen spend. Measuring water usage at the farm dairy can help you determine where changes to your current system can be made (e.g. wash-down process, milk cooling efficiency). Making changes to improve efficiency at washdown means less water going into your effluent systems, less pumping and lower storage costs. Go to dairynz.co.nz/water-use to complete a DairyNZ ‘Smart Water Use on Dairy Farms’ action plan. When grazing a crop paddock, always graze from the top to the bottom of the paddock. Why? Because the ungrazed area of paddock acts as a filter strip which reduces the risk of sediment entering waterways. On a wet day, look at the water flows on your races and create cut-outs with a spade to allow water to flow back into the paddock. The paddock filters sediment from the overland flow before it reaches a watercourse. Find a large sealable container, fill it with clean sawdust from the calf shed and place it by your fuel tank. In the event of a fuel spill, you’ll have an absorbent material nearby to soak it up. Put an old concrete trough in your lockable chemical store and use it for storing chemical containers. This acts as a containment bund in case of any spills. Calibrate your effluent irrigator/spreading equipment by completing an effluent depth test. This provides information on your spreader accuracy, provides you with good records, and allows you to make changes to application if inaccuracies are found. 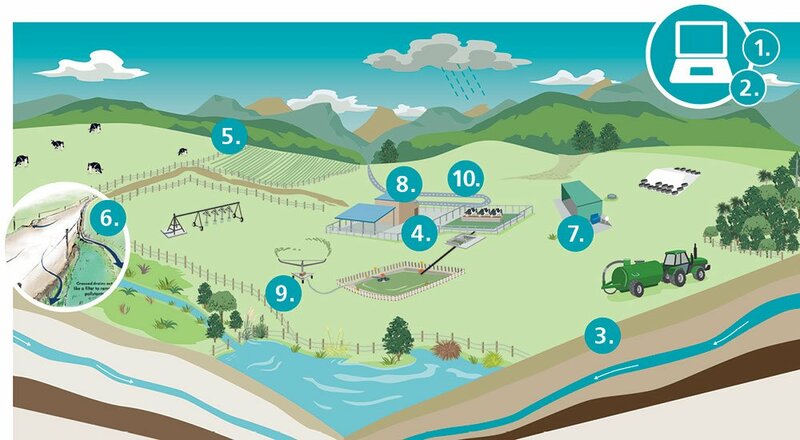 For help managing farm dairy effluent, visit dairynz.co.nz/effluent-management. Create a dung buster on your backing gate to break up dung during milking. This could be as simple as hanging an old wash-down pipe (filled with sand) to your backing gate. As the gate moves, it breaks up the dung. This can help reduce washdown times and water usage. Remember, the actions you take on-farm will influence downstream water quality. Every improvement you make increases the sustainability of your farm and the industry. To learn more visit dairynz.co.nz/environment.